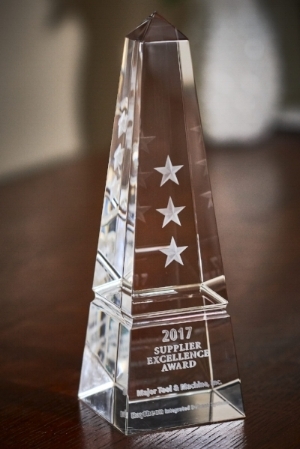 Raytheon’s Integrated Defense Systems business instituted the annual Supplier Excellence Awards program to recognize suppliers who have provided outstanding service and partnership in exceeding customer requirements. Award candidates are judged on certain criteria, including overall quality and on-time delivery. Major Tool & Machine (MTM) was one of 66 companies recognized by Raytheon’s Integrated Defense Systems business for 3-Star honors. It marks the seventh year MTM was recognized by Raytheon. Major Tool & Machine (Indianapolis, Indiana) provides manufacturing, engineering, fabrication, precision machining and assembly services to a variety of United States and international customers. They are a registered small business with 400 employees and support several critical defense programs for Raytheon.